As the 2016 show season gets in full swing, talented 4-year-olds are making a name for themselves at The Ike Derby and Classic in West Monroe, Louisiana. Metallic Rebel and Beau Galyean left the event with the 4-Year-Old Open Championship notched onto their résumés. Metallic Rebel (Metallic Cat x Sweet Abra x Abrakadabracre), bred by Alvin and Becky Fults, of Amarillo, Texas, wowed the judges to the tune of a 225. In exchange for their intense run, the stallion and Galyean took home a hefty $21,751 paycheck. 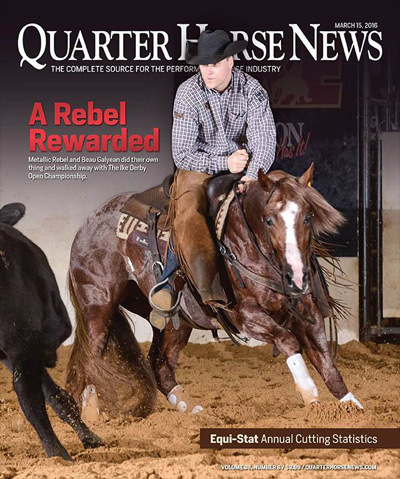 Thomas Guinn, of Philadelphia, Mississippi, owns Metallic Rebel, who began his career with a trip to the National Cutting Horse Association (NCHA) Futurity Open semifinals. The stallion went on to finish third in the 4-Year-Old Open at January’s Abilene Spectacular, where he garnered $17,731. Galyean, an Equi-Stat Elite $2 Million Rider from Fort Worth, Texas, advanced three horses to the 4-Year-Old Open finals. He finished fifth with a 218.5 aboard Chrome Catillac (Metallic Cat x Tootsie Rey x Dual Rey), who also won the Gelding and Novice Horse classes. His other horse, Catish (High Brow Cat x Peppys Stylish Lena x Docs Stylish Oak), finished in a tie for 13th after marking a 214.5. Altogether, the rider amassed $44,685.